The airline schedule importer allows airline pilots and flight attendants to import airline schedules for over 200 trip formats as listed below. 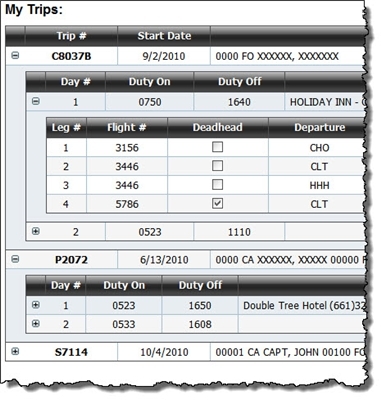 Imported schedules are saved to your secure cloud storage until downloaded for use in Airline Pilot's Daily Aviation logbook (APDL) software or imported into Logbook Pro Desktop edition (1.11.x or later required), Logbook Pro for iPhone, iPod touch, iPad, Android, Kindle Fire, and NOOK tablets. The schedule importer allows you to copy in your trip data and the system will process it and convert it into a format for consumption by a logbook to use or also offer export options such as to iCalendar, tab/csv exports, and FFDO formats. You can copy in your schedule data then it saves to your cloud account. You can then import this data into Logbook Pro Desktop (PC) edition or an app such as the iPhone or Android app. The app will load your flight log for you automatically and mark the flights as pending (in the apps) then you can fly the flight, update the times and clear the pending checkbox and sync to Logbook Pro desktop. Download trip data in iCalendar (.ics) format and then import into your favorite calendar system. With trip data in your calendar your spouse or scheduler can see your trip schedule in with reminders set so you're sure not to miss a trip. Export schedule importer information to TAB or Comma (CSV) delimited files for use as needed. In addition, airline crew participating in the Federal Flight Deck Officer Program (FFDO) can download custom formatted files which you can then copy and paste directly into your FFDO portal to upload your trip information. Click here to try the airline schedule importer without any purchase required. Login (create an account if needed) and then paste in your trip data and verify the processed trip information in the trip grid by expanding rows as desired by clicking the + button to the left of each row. Test data is not stored, subscribe to persist your trip data for integrations or exporting. Affordable subscriptions are available in various term lengths to suit your individual needs. Already purchased a subscription? Click here to start importing your trips now. Purchasing this product provides access to your personal cloud trip storage and schedule importer functionality for the selected term length and removes non-subscriber restrictions. While your subscription is active you will have unlimited access to the airline schedule importer portal accessed from your My Account/My Schedule Importer area and all available features. 30 Day: For airline pilots not actively flying or employed but need access to the schedule importer to import prior data into their logbooks, this is an affordable option for temporary use of the schedule importer system. 1 Year: Allows unlimited access to your personal schedule importer and cloud trip storage to import schedules and export for use with any of the supported platforms for one year. 2 Year: Our most affordable subscription allows unlimited access to your personal schedule importer and cloud trip storage to import schedules and export for use with any of the supported platforms for two years. Try before you buy: The schedule importer portal allows you to test your trip importing but it will not save the information to your cloud storage nor can you download files for APDL or iCalendar. All downloads and integrations require an active subscription.